Does your brain need a workout? Did you ever spend hours playing quiz games? Ever want a game to make you feel like you wasted all those years in highschool? GOOD! Go! 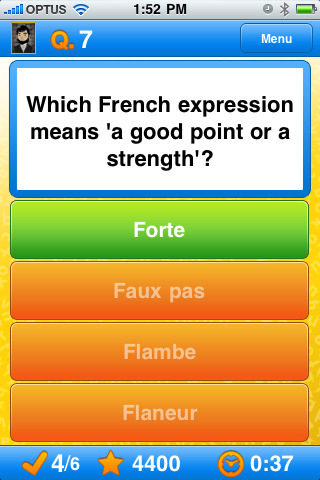 Word Power is a quiz game by YouPlay on the iPhone, iPod touch, and iPad for $1.99. There are 2 game modes in Go! Word Power. The first is under the ‘Play’ button on the main menu. Try to beat the clock while answering 10 questions as correct as you can get it. The second is under ‘Word Dash’ where you have a 2 minutes to answer as many questions as you possibly can correctly. This is a fun little game of trying to improve how quickly you can answer these really difficult questions. The questions seem like they are straight out of the SAT or ACT tests. Which word below means this and that? What is the correct spelling for this? What word is before that, but after this? These questions are real brain stimulators and are surprisingly effective at getting you to learn new things. You can connect to Facebook to submit scores and your times for all your friends to check out, but you can also just play the game without logging on or submitting. Both game modes are well done for the challenge. Graphically, there isn’t much to talk about. Everything is self-explanatory, the buttons for your answers are huge and easy to read, and the questions are short and bold. Everything explains itself. I had an enjoyable time with this app. Go! Word Power is a word game for word game fans and it won’t disappoint. 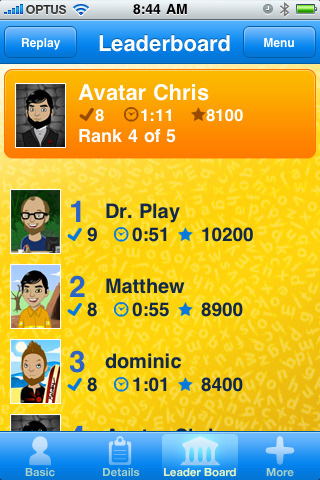 You can choose your own avatar for your character portrait and you can check out the leaderboards for other peoples’ answer accuracy, time, and high score. It’s a good game with a solid execution. Nice job YouPlay. AppSafari review of Go! Word Power was written by Joseph Ho on September 2nd, 2010 and categorized under App Store, Education, Featured, Games, Word Games. Page viewed 4719 times, 1 so far today. Need help on using these apps? Please read the Help Page.